Lalibela, Ethiopia is considerably a small town, but famous of its Rock Hewn Churches. Every year, there are many local and foreigner tourists coming to the town to visit these churches. It is hard to find large plots of lands to plough as the town is surrounded by many high mountains, and there is no any industry or high trading system as it is impossible to get the necessary resources for input. So, tourism is said to be the only income generating business for the people there. That is the reason many people are getting involved in this business directly or indirectly though the business has never brought the change the people expected. One of its manifestations is that, Lalibela never had an Asphalt road not only within the town itself but to connect with the neighborhood towns. The “main road” circulating in the town is still a gravel and dusty road which makes the town even more terrible for visitors. When there is tourism, there is traffic. So tourists and drivers are forced to clean and wash their vehicles at least two times a day. 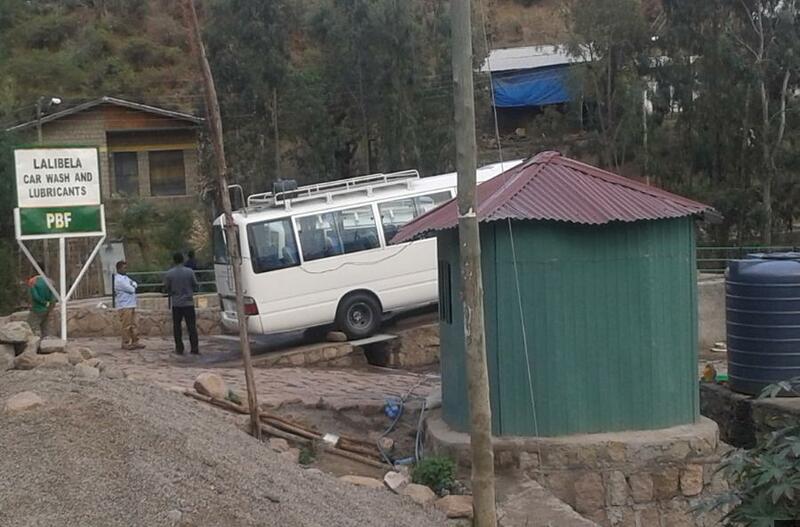 For years, these drivers were forced to do this washing by themselves going to the nearby rivers as there was no anybody to give this kind of service in the town. So, this was also adding burdens and waste of time for the drivers and the guests. Searching for the untouched problems and solving these problems by integrating the jobless youth (which accounts 45% of the population) in the town has been one of the PBF’s great commitments for years. Putting the above points into consideration, the PBF has organized 7 jobless young and energetic boys to be involved in giving a car wash service. All the group members came from countryside many years ago with an intention of searching for jobs and for a better education like many of their friends. But it was harsh for them to compete with the boys who were already fit to be able to hassle tourists and earn their income. So year by year, they drop out of school and forced to sleep on the street where they met each other for the first time. Since then, their friendship gets stronger and develops the spirit of working something together. The PBF opened them a window to be organized legally and convinced them to work together in a car wash project. The local government has facilitated and provides a small plot of land nearby the “main gravel road”. The PBF provides the financial support for the water line installations and other related works. But the group was able to continue their work there for only four months as the road nearby is going to be upgraded and the new alignment is supposed to pass through their car wash. The PBF again facilitated ways with the local government to shift this car wash business to a new but permanent working place. The construction of this new car wash project was begun on Nov 28, 2015 and it is completed on Jan 21, 2016. This was with an objective of not only just washing cars but also selling different kinds and brands of lubricants and even changing motor oils. The PBF has invested a lot to realize this project and it is considered to be one of the great accomplishments of integrating community projects. This car wash project is supposed to give service for Bajajas (Tuk Tuk), Automobiles, Minibuses and even buses and trucks so that the group will have many more customers throughout the day. What makes unique this project is also, the waste water from the area is accumulated into a reservoir so that the people working there are responsible of gardening and reforestation the nearby dry area. The project was officially opened on March 27 in the presence of the VIC and local government officials. The group members are now working hard in harmony to change their life for better.